Many patients are predisposed to respiratory problems in the dental setting; these patients include patients with asthma or chronic obstructive pulmonary disease (CO PO), extremely anxious patients, patients who are. 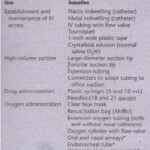 atopic, and those in whom a noninhalation sedative technique using respiratory depressant drugs is to be used. Special precautions should be taken to help prevent the occurrence of emergencies. If these patients are not treated promptly, • the situation may become life threatening. 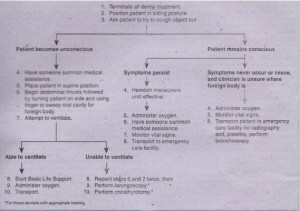 patients may become hypoxic and cyanotic, with eventual loss of consciousness (Box 2-6). through the lungs The patient rapidly becomes alkalotic; may complain of becoming lightheaded and of having a tingling sensation in the fingers, toes, and perioral region; and may even develop muscle twitches or convulsions. Eventually loss of consciousness occurs (Box 2-7). sedated. 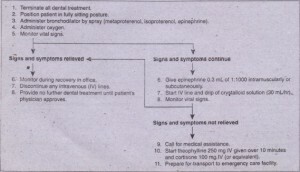 Once hyperventilation stops, the patient should be rescheduled, with plans to use preoperative or intraoperative sedation (or ‘both) in future visits (Box 2-8). with. well-compensated COPD can have difficulty during oral surgery. Many of these patients depend on maintaining an upright posture to breathe adequately. In addition, they become accustomed to having high arterial . 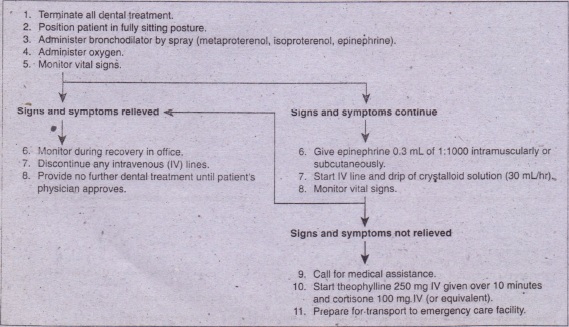 to clear when supine also accompany COPD. CO2-enriched air; reversing tendency for alkalosis caused by hyperventilation. be initiated ‘and emergency assistance summoned. ‘lungs cannot be filled with air before the attempted cough. Inthis situation the patient usually cannot produce any vocalizations and becomes extremely anxious. 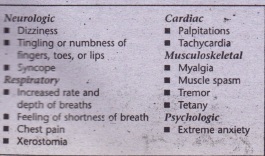 Cyanosis soon appears, followed by loss of consciousness (Box 2-9). 3. Attempt to verbally calm patient. and out of a small bag. 5. If symptoms persist or.~orsen, administer diazepam. 1M, Intramuscular; III, intravenous . He. 2-6 A, t\ lethod of f1crfc,~;nmg abdominal thrusts for an unconscious patient with foreign body obstructing airway. Chair is first placed in recumbent position. The heel of the dentist’s right palm is placed on the abdomen just below the xiphoid process, with the elbow Kept locked and the left hand placed over the right for further delivery of force. Arms are quickly thrust into ‘the patient’s abdomen, directing force down and superiorly. 8, Proper positioning for Heimlich maneuver is shown. Rescuerapproaches the patient from behind and positions hands on the patient’s abdomen, just below the rib cage. Rescuer’shands are then quickly pulled into the abdominal area, attempting to have any residual air in the lungs dislodge the obstruction from airway. caught.in throat • Hypotension . sedation or has a completely obstructed airway and loses consciousness, abdominal thrusts should be performed with the patient in a supine position. 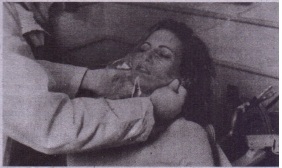 After each volley of thrusts, the patient should be quickly turned onto the side and the clinician should finger sweep the mouth to remove any Object that may have been forced out. Ifthe patient is not exchanging air, BLS should be started. If air cannot be blown into the lungs., additional abdominal thrusts should be attempted, followed by oral finger sweeps and BLS. Dentists trained-in laryngoscopy can look into the larynx and use Magill forceps to try to remove any foreign material. If several attempts to relieve the obstruction fail, an emergency cricothyrotomy may be necessary (Fig. 2-7) . delivery of high concentrations of oxygen. Prevention of gastric aspiration involves instruction to patients to avoid eating or drinking for I) hours before any oral surgery appointment during which they are to be moderately or deeply sedated. 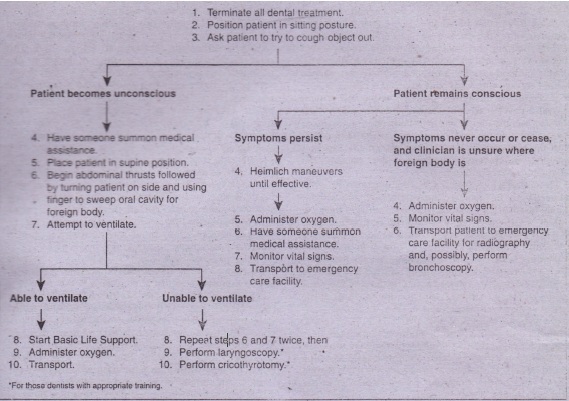 symptoms exhibited by patients preparing to vomi t. High-volume suction should be used to assist removal of vomitus from the oral cavity, If the clinician suspects that gastric material may have entered the lower respiratorv tract, a call should be placed for emergency assistance. The patient should be placed on supplemental oxygen and vital signs monitored, If possible, the dentist should gain venous access (i.e., start an IV) and be prepared to administer crystalloid solution (e.g. normal saline or OsW) to help treat a falling blood pressure and allow emergency technicians to administer IV bronchodilators if necessary. Immediate transportation to an emergency facility is mandatory (Fig, 2-8).